Two daughters, two pairs of parents, two families representing an estimated figure of some one million affected people in the former GDR. Time Without Parents tells the story of Jana Simon and Franziska Kriebisch who both grew up in the GDR. They didn't know each other but shared the same fate of being separated from their parents from one day to the next after the secret police arrested them. 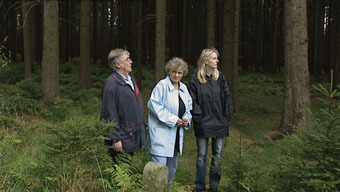 Jana's parents are arrested after trying to escape with their children; Franziska's parents are arrested after applying for an exit visa. Franziska and Jana were both 10-years-old at the time. Jana and her brother are taken to an orphanage; Franziska and her brother are then raised by their grandparents. One year later, both pairs of parents are released. The Kriebisch's freedom is paid for by West Germany. The Simons continued to live under observation until the fall of the Wall. But a normal family life is no longer possible. The experiences leave their mark and both families fall apart. Since then, no one has talked about what actually happened. Celia Rothmund was born in 1974 in Freiburg. After studies in Media Arts/Film and Art History in Karlsruhe, she completed post-graduate studies in Film & Television at the Academy of Media Arts (KHM) Cologne. Her films include: Portraets (documentary short, 2001), Eine Reise zurueck (documentary, 2002), and Time Without Parents (Zeit ohne Eltern, 2005).